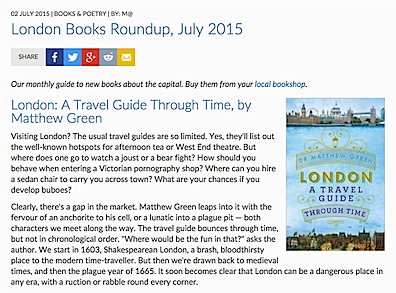 Reviews of my new book, London: A Travel Guide Through Time, are trickling in. And so far, they’ve been glowing, which leaves me thrilled to little bits. The Londonist – the thinking man’s Time Out – has described it as “easily the most engaging social history of London since the books of Liza Picard a decade ago”. Riffing on the time travel theme, it reports that the book is “written with such a storyteller’s flare that the pages whizz by like a hover-converted Delorean”, referencing Back to the Future. They made it their Book of the Month for July; read the full review here. Dr Matthew Green, historian, broadcaster and author of London: A Travel Guide Through Time, has a knack for revealing the most unexpected details of London’s multifaceted past in fascinating and accessible detail. a must for anyone interested in London’s history…Matthew Green’s time travelling vehicle’s headlights focus on fascinating details, time after time, as it swoops round London…his research can’t be faulted. I enjoyed this book immensely. Matthew Green has executed an original idea extremely well. Every page yields fascinating glimpses into the past habits and horrors of our greatest city, bringing to life the detail of daily existence in an unforgettable way. There are many surprises for all of us here about how Londoners lived, at least as much, it turns out, in the 1950s as in the 1390s. An excellent and vivid work of history. The author, readers, was none other than Mr William Hague. (You can see both Mr Hague and Ms Picard’s reviews on the review section of the Amazon page). Elsewhere, Mike Paterson, the director of the remarkable forum and club London Historians has described the book as ‘a wonderful debut‘, ‘genuinely interesting‘, and a ‘brilliantly observed work‘. He singles out the chapter set in 1950s London for particular praise, a world of Blitz scars, bohemian espresso bars, Brutalist skyscrapers, and the profligate bon-vivants of the original Chelsea set. Read his detailed write-up here. Hopefully, more reviews will follow. In the meantime, why not get in on the act yourself, order a copy of the book, and leave an Amazon review. To date, there are 12 customer reviews, all awarding the book five stars. Alternatively, leave a review on its Goodreads page.